The customer left his vehicle standing for 2 months and when he went to jump start it, it did not start. The customer had a local garage diagnose the fault as a faulty ECM and the engine does not crank at all, so the customer sent the unit in for testing and repairs. The ECU Testing confirmed the unit was faulty and had been spiked, possibly by jump starting the vehicle without surge protectors or having the cables touch or fitted the wrong way round. We were able to repair this unit and it passed on our ECM Testing rig. This vehicle is fitted with a Siemens SIM210 Engine ECU and we are able to fully test & rebuild these units. 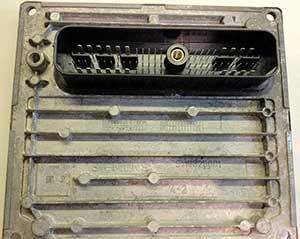 If your Ford has a faulty ECU, get in touch with us today. You can email us, drop in or call 0208 853 5000. This entry was posted in Repaired ECU's and tagged Ford Fiesta ECM Problem, Ford Fiesta ECU Fault, Ford Fiesta ECU Repairs by smartAjaz. Bookmark the permalink.